The PMD Advanced Kit Replacement Discs offer the ideal selection of discs for regular, practiced users of the Personal Microderm unit or those with particularly coarse skin. 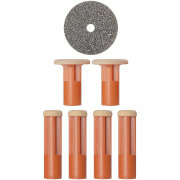 The set includes one small and one large Green disc (Moderate), one small and one large Orange disc (Coarse) and one small and one large Red disc (Very Coarse). The versatility and range of discs available allow you to create a personalised treatment for optimum results that suit your specific skin type and need.